(Reproduced from an article on drone.farm). This morning, DJI announced the Phantom 4 [pre-order from DJI], the latest in its line of best-of-breed consumer drones. The new Phantom 4 is the first shipping consumer drone to feature obstacle avoidance and subject tracking using its front-facing vision cameras. 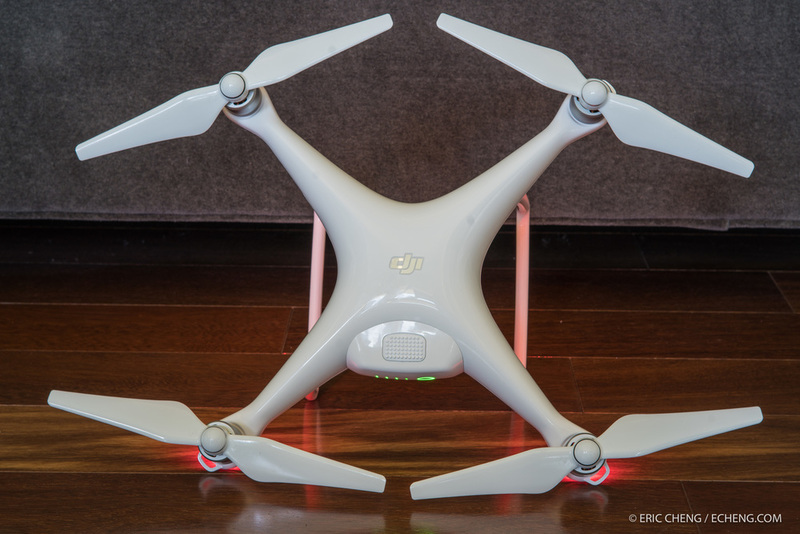 I was hoping that DJI would shake things up with a completely new design to make the Phantom easier to transport, but the new Phantom retains the same basic design language as its predecessors, only it's gone glossy and sleek. The top of the Phantom is extremely plain, and has the too-clean look of a de-badged car. I wish there were visible design elements introduced to help guide the eye along, but I suppose that once the thing is in the air, no one is going to be looking at the top. The bottom, however, has the feeling of sleek integration, and makes the new Phantom look and feel extremely polished. The two-section gimbal of previous generations has been replaced with a new, cleanly-mounted, 3-axis gimbal that pokes out of a composite wrap. The new gimbal anchors the camera on both sides, using two motors to control pitch. The Phantom 4's camera uses the same sensor as does the camera in the Phantom 3 Professional, but features a new glass lens that is supposed to yield sharper images and better colors. The front of the Phantom 4 features a set of stealthy stereo vision cameras that have been integrated on the body above the landing struts. 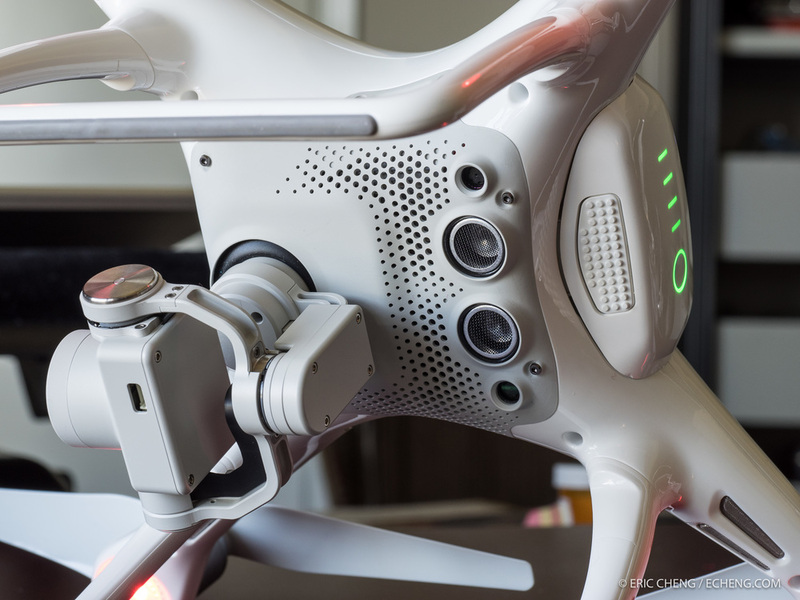 DJI Phantom 4's gimbal-stabilized 4K camera and arm-integrated vision sensors. 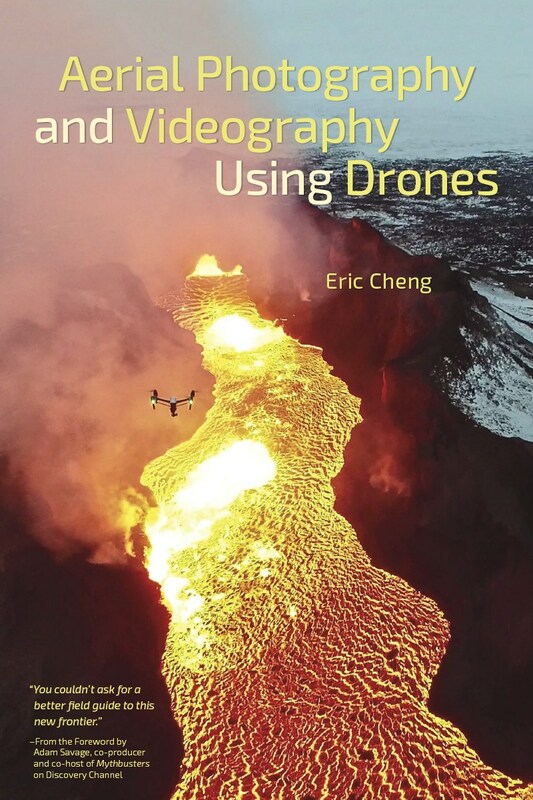 The understated visual design belies the tremendous power that drones get when they are given dedicated vision and onboard computational power for identifying and tracking objects in 3-dimensional space. Using its new stereo vision system, the Phantom 4 can detect and avoid obstacles, as well as track and follow operator-selected subjects. This new front-facing vision system is what DJI was referring to in its "Return To Your Senses" teaser video published on Feb 24—bizarre, because it's unclear what we're "returning" to; it's never been better in the drone industry than it is now. New battery: 5350 Mah, 15.2V battery (rated at 28 min flight time). Some flights from prototypes have been 30 mins or more. Object detection and avoidance will quickly become commoditized because they are included in drone-infrastructure plays by Intel and Qualcomm. 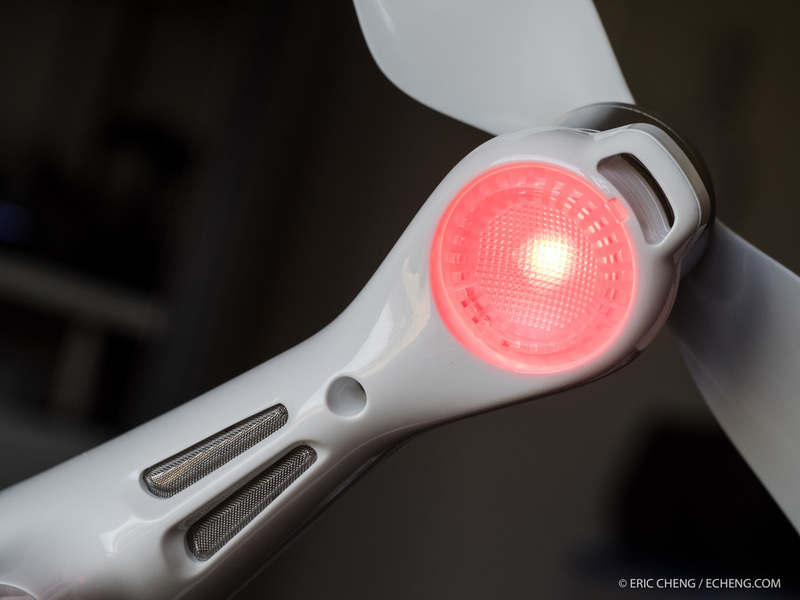 At CES 2016, Yuneec was favored by the press with its demonstration of Intel RealSense integration in its Typhoon H hexacopter, which is supposed to ship this summer. The demo video is impressive and shows what real-world usage of follow-me with object avoidance might look like, assuming you were willing to bet your $3K (or whatever) drone on how well its new eyes and brain work! 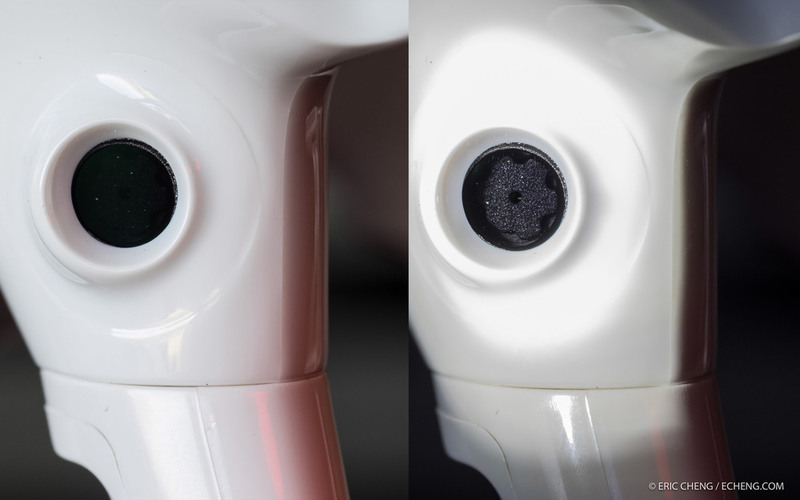 The inclusion of stereo vision sensors in the Phantom 4 shows that DJI has also been hard at work integrating its version of sense-and-avoid, and the fact that DJI will ship way before Yuneec's Typhoon is a testament to DJI's product prowess. 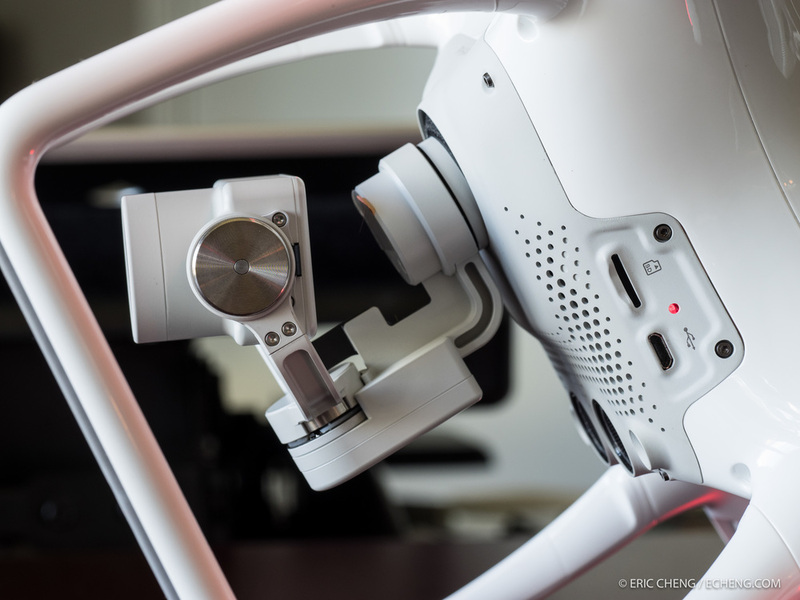 Front-facing vision sensor on DJI Phantom 4 as it looks normally, and with bright light applied to show the camera behind the cover. DJI hasn't disclosed what or whose technology it is using behind the scenes, but from demos, it's clearly fairly sophisticated. In manual flight, the Phantom 4 will stop before it hits obstacles, but when flying autonomously in TapFly or ActiveTrack modes, the Phantom 4 will avoid objects and continue flying. I haven't tested these modes myself but I've seen videos, and it looks like it works really well. Particularly impressive is ActiveTrack mode, which allows an operator to select a subject by drawing a rectangle around it. Because the new Phantom builds a depth map using its stereo vision sensors, it can automatically find the closest object in the rectangle you've specified and select it on the screen. The Phantom also knows when you've selected a person, which is important because it can track people even if they turn. A Phantom 4 detects Romeo Durscher and is ready to follow him. Once you've selected a subject, you can tap "GO," and the Phantom 4 will follow that person (or thing) around. As mentioned above, the Phantom 4 specifically recognizes people, and also recognizes some typical movements like walking, running and cycling. I saw some footage of Romeo trying to hide from the Phantom 4, and the only way he could do it was to hide behind something for an extended period of time. When hiding for short periods of time, the Phantom 4 would reacquire subject lock when he reappeared on screen. During tracking, an operator can pilot from side to side (rotating around in an orbit), and can also ascend and descend. The Phantom 4 will also actively avoid objects by navigating around them, although it will stop if a large obstacle is detected. Note also that if an operator orbits during tracking, the Phantom 4 can crash into obstacles because its vision sensors only face forward, and the Phantom always faces its subject in this mode. Yuneec's Typhoon H w/Intel RealSense might be more effective at avoiding obstacles during orbits because it can swivel to face the direction of movement while keeping its camera stays trained on a subject. No one knows yet how effective either of these systems will be in the real world, but it's also an unfair comparison because the Typhoon H is also likely to be 2-3x the price of the Phantom 4. These new vision systems are the first that are being offered to consumers, at least, as systems that are integrated into drones, so we shouldn't expect too much. As a general rule, if a particular scene might fool you, it will likely also fool the drone. Things that might not be detected with high accuracy include strongly backlit subjects (e.g., when you are facing the sun), glass, mirrors, thin wires and tree branches. But given the rough state of DJI's object avoidance last year during the release of the M100 developer platform, I'm impressed with how far the technology has come. There has been a huge increase in performance and usability, and if this rate of progress continues, vision systems in drones will surpass human vision capabilities in the very near future. The Phantom 4 is $1399 and is available for immediate pre-order at DJI and Apple's online stores. It will ship when available (est. March 15). On March 15, the Phantom 4 will also be on shelves at DJI Flagship stores and at Apple stores worldwide. On March 23, DJI dealers, who seem like they are not getting a great deal in this release, finally get to sell the product. Who Should Buy a Phantom 4? At $1399, the Phantom 4 is just a little more expensive than the Phantom 3 Professional was when it was announced a year ago. At that price, the Phantom 4 is worth every penny, and the new Phantom is likely to retain its position as the best value in an aerial-imaging quadcopter. The fact that it is now much harder to crash a Phantom 4 is a great thing, although I've seen a lot of people crash while flying sideways and backwards, so new pilots will still be able to destroy their hard-earned purchases. The technology is not (yet) foolproof, and I recommend never relying on object avoidance to prevent crashes (i.e., you shouldn't be planning to use early vision-enabled drones to avoid obstacles, even though there will likely be marketing videos demos showing drones doing this). If you want to document yourself doing an activity in an open environment without obstacles and want a drone that follows you, you should consider getting a Phantom 4. But you should also learn how to operate a drone competently, because you will inevitably have to take control at some point, especially when landing. If you want a drone that follows you as you run through a forest or while you ski down a hill with trees on it, you should NOT buy any drone. You should get someone to show you what drones can actually do. And you happened to kickstart or pre-order a follow-me drone, try to get your money back ASAP. I'm excited about the Phantom 4, but I'm also excited by what's going on with the Phantom 3. The Phantom 3 Professional has dropped in price to $998, and the various bundles are now really great deals (w/extra battery; w/battery & 64GB SD card; w/battery and backpack). The Phantom 3 Advanced is an incredible $769. The P3 Advanced will take still images that look identical to what the Phantom 4 produces, and when published to the web, videos from all of these systems will also essentially look the same. If you're looking for a photogrammetry / mapping platform, the P3 Advanced will be identical, and will actually likely work better because the Phantom 4 is unlikely to be supported by app developers for some time. Also, given DJI's distribution history, it will likely be almost impossible to get extra batteries for the Phantom 4 for some time after launch, so I wouldn't plan on using one for any real projects until batteries are available, and until firmware stabilizes. 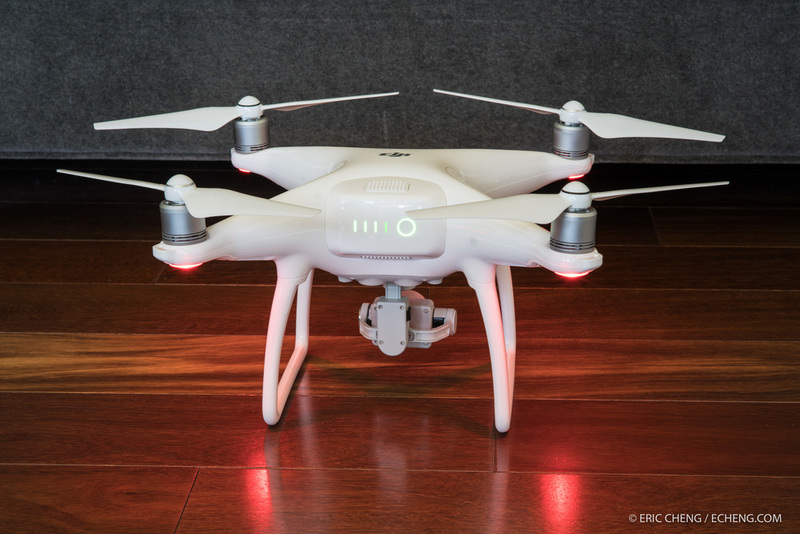 Note that I do not recommend (and never have recommended) the Phantom 3 4K, which costs $998. 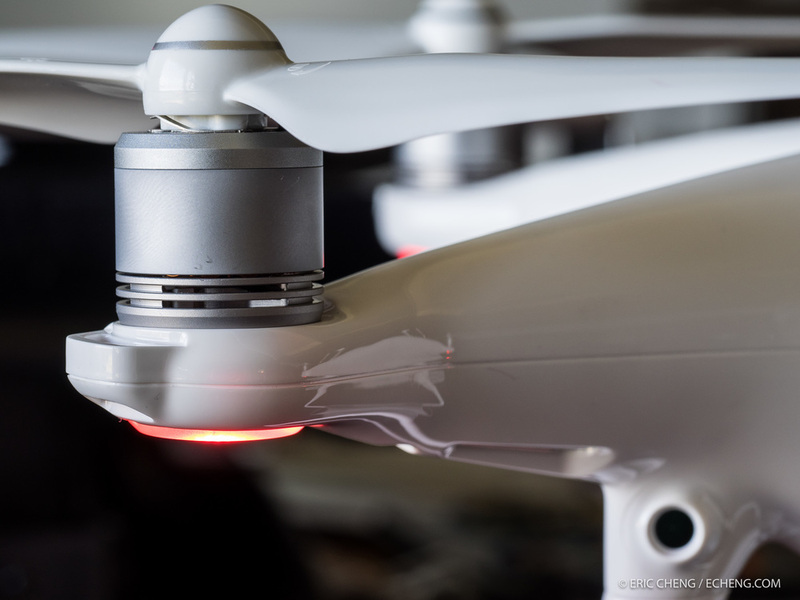 The Phantom 3 4K uses Wi-Fi to communicate with the drone, which is not nearly as reliable as Lightbridge, which the P3 Advanced and Pro both use. I don't understand where the Phantom 3 4K fits into DJI's product strategy, especially with such a fast product cycle. It was introduced late, to very little fanfare, and serves only to confuse customers. Will I buy a Phantom 4? I might. I love experimenting with new technology, and the new vision system and subject tracking are signs of what will surely be standard in consumer drones by the end of the year. But as a seasoned pilot and aerial imaging guy, the main reason I’d buy a Phantom 4 is for its new Sport option. I want to be able to fly to and from locations at full speed, and the previous limitations in pitch angle were always a limiting factor. The second reason I’d buy a Phantom 4 is for insurance during emergency return-to-home. If I for some reason lose situational awareness and fly out of line of sight, I like that the P4 will try to avoid obstacles when trying to return home. I realize that this might result in the P4 just hovering for awhile, but at least it might give me a chance to move around the obstacle and regain control. Some folks are disappointed that the Phantom 4 doesn’t have notable camera improvements (they whine: “I’m so mad that the newly-announced, computer-vision-aided, flying camera isn’t better!”), but the addition of stereo vision and computer vision to the Phantom 4 is a huge indicator for what is to come. Drones are now able to see their surroundings and interpret what they see, and if access to such sensors are opened up to developers via the SDK, just imagine what folks will think of! 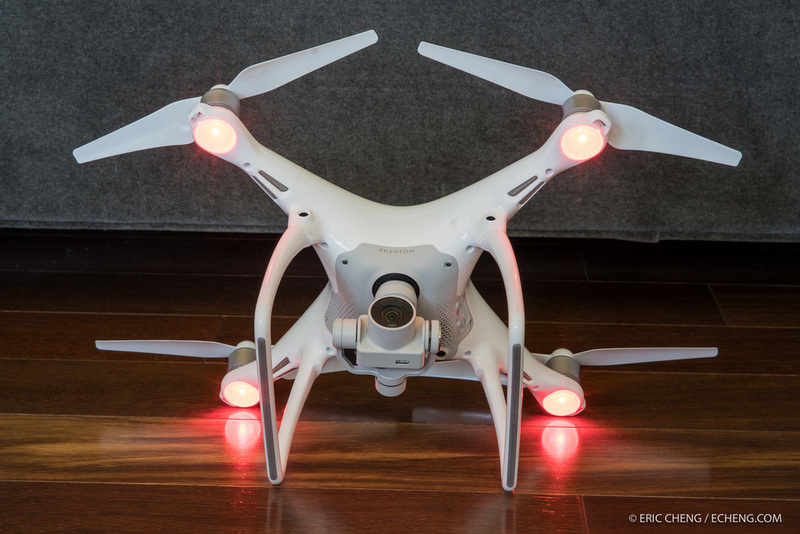 Update: check out Romeo Durscher’s informative post about the Phantom 4. Hooray! If you made it this far, you get access to the hi-res photos. Head on over to http://ech.cc/p4photos and use the password “dronefarm” to download.